As everyone knows, rarities are an integral part on Chickensmoothie. Each pet is assigned a rarity; but what all does this mean? There are tons of common pets, so does that mean every common is worth the same? What about every very rare? In this guide I intend to debunk a few myths about rarities and explain rarities in an accessible manner that makes sense to everyone. As Nick and Tess don't intend to give us the date on which pet is rarest and so we are kind of "shooting blanks" this guide is based on the general opinions of the rarity-wise CS population. 1 What is a rarity? 2 How does rarity work/get assigned? 5 Is there a such thing as rarity math? 6 What else affects rarity? I included the abbreviations of each rarity (tag). Those are our basic rarities. Easy enough. There is one last rarity tag I did not mention. This is the unknown tag. Pets who have unknown rarities are new pets that have just matured and hit their adult stage. They will be assigned rarities towards the end of the month, so don't panic if your pet has an unknown label! The only other reason a pet will have an unknown label is if they are a custom. For more about customs please click here. How does rarity work/get assigned? As you can see, the grown owl is common, whereas the egg is rare. This means that there are more owls in circulation compared to the PPS egg. So for example, there might be 30,000 grown rainbow owls, but only 10,000 rainbow PPS eggs. This is from 2009, so the numbers are out of date, but it gives you an idea of how the rarities work. As you can see there is a big gap between rare, VR and OMGSR, so please continue reading. I'll talk more about how one VR is not necessarily worth another VR later on in this guide. As mentioned before, rarities get assigned at the end of the month, but they also will change at the end of the month. I will explain a bit more on changing rarities in the next section. Every month there are certain pets which change rarity tags. If you are interested to see the thread in which this is recorded please click here. To see a list of what has changed when, click here. Rarities change over time, so sometimes you might find that the uncommon pet you adopted a few months ago has turned rare. Neat, huh? But why does this happen? You have to consider that everyday, new people are joining CS. Pet rarity does have to do with the amount of that certain pet in circulation, but also with how many members CS has. The more members, the less of that pet to go around to every member. (I need to make this a bit clearer, I don't think I did a great job explaining this). This means every so often pets will turn rare. But why didn't all your uncommons turn rare? This has to do with the amount being released. Certain uncommons are more uncommon than others. The uncommons that are harder to get are more likely to turn rare faster. In each litter of dogs released every month, you will find some outcomes are extremely easy to get, whereas other ones are more tricky. Just because it's hard to get an outcome though doesn't automatically mean it will be rare. More than likely, it will be uncommon, but probably turn rare perhaps in a few months. I find the best way to figure out which pets have changed in rarity is to start a trade with a friend, and just go through your groups. I don't actually send a trade, but being in "trade mode" allows me to see pet rarities much easier without having to click on each pet's individual page. Everyone on CS wants rares. Rares are desirable pets, and they even have a tag to prove it! This being said, it's not always easy to get them. Usually your best way to get a rare is either to trade for one, or adopt one in the monthly adopts. For more information on rares and how to get them, please click here. Is there a such thing as rarity math? Does this have any merit? I am going to answer this in a simple one word answer: no. Unfortunately that is not how rarities work on CS. With simple swaps, it can be okay. For same rarities, I like to use the "three month rule" - three months ahead or behind is a fair swap for certain pets. So if I have a pet from April and it is common dog, it is totally fair for me to swap it for a common February dog or a common July dog. This is not the case when it comes to higher rarities. Anything worth more than an uncommon should be considered individually. As with all pets on CS, there are some pets which hold the same rarity tag but are worth different amounts. Take for example the Moonswirl vs the non swirl. They are both from the same month, year, litter, everything. They even have the same rarity tag! Even with this in mind, the Moonswirl is worth 3x the value of the non swirl. Why?! Remember those rarity changes? It has to do a bit with that. 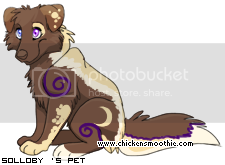 Rarities did not come into play on CS for quite some time (please give me the date, as I cannot find it), and when they first arrived, the non swirl was uncommon, and the moonswirl was rare. Again, to put it into perspective, there might be 3000 non swirls on CS, but only 1000 moonswirls. That is a big difference and must be dealt with accordingly. So even though they both share the same rarity tag, they cannot be evenly swapped. For more information on high rarity pets, please click here. There are many things that affect rarity. I'm going to break this down into a few categories: Demand, Type, Date, Special Events, Re-releases, Store Pets, Hoarding & Items. Demand is probably one of the most important thing to consider in rarities, besides their face values. Certain pets are just more in demand. The more people who want something, the more popular it is. Usually then supply is increased. On CS, since supply is never increased (except on December 18th which I shall touch on later) the rarity of certain pets will just continually go up. Demand must be taken into account with all pets, as even certain commons are more in demand than others. Unfortunately, not all the types of pets are popular with all of our users. Most users value dogs far above other types of pets. Rats are not in demand and so they are "worth less". Same with horses, Nick pets, etc. This must be taken into account when dealing with rarities, since dogs are usually the most in demand and thus worth more. Everyone hears talk about the dates of pets. Dates MATTER, a lot! A very rare from 2008 is worth much more than a very rare from 2011. Why? Well, there are a lot more players now adopting pets, and even though they're both very rare, as I mentioned before, there is a difference in the numbers of pets available. Stick with the three month rule I mentioned before, and it will help a lot (at least for our uncommons/commons). This being said, there are some pets which "defy" this rule. Those are: any UR pet (for more information on URs click here), the U-Nick-Orn, Rainbow Mane, Wood Angel, Dark Pink Shima Bwolf, Any VR Malk Dragons, Wolf PPS, Blood PPS, Grinners and any of the '09 Easter Hunt Bunnies which are VR. These pets may have dates in 2009/10/11 but they are still comparable to some '08 pets. Besides those pets, none of the 09/10/11 pets are comparable to really any '08 pets unless in bulk. Certain pets are given out during special events; Valentines Day, Christmas, Halloween, Easter, etc. These pets are worth more, usually because you have to do a bit more to get them, and they are not easily available. They may only be adoptable for a few days, or even one. This alone makes them worth more. 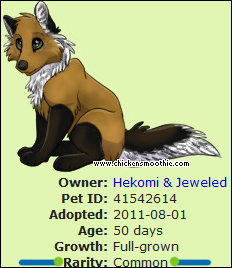 Each year on December 18th, the CS admins allow every user to adopt two pets, at random, from a long time ago. These pets are usually Rare+ and if you get really lucky you might get a pet from '08 or even an "UR" or unreleased pet. 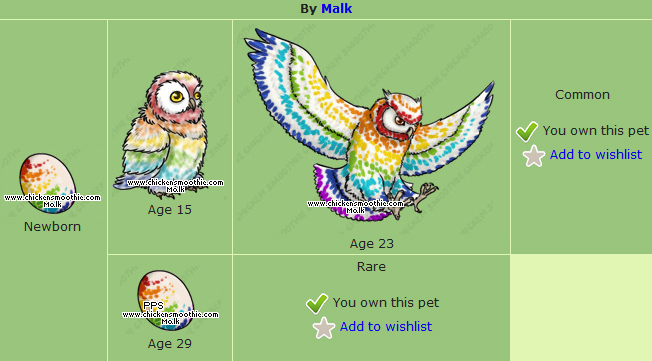 There is a lot of debate on whether or not these "re-released" pets are worth the same as their "true date" siblings. I personally value them as the same, and most of the people on CS will as well. Store pets kind of defy rarities. Every two months there are usually around 2-4 new pets available from the C$ Store for virtual chicken dollars. They come out with a VR tag, but of course are not comparable to other VRs. For the first four months that they are around, they are worth about a good '09 rare (since of course, you're paying real money for them). After that they have to be dealt with individually. Most store pets aren't going to fetch you a lot, but older store pets, like the Orange Cerberus can get you quite a bundle. Hoarding means that you own and actively trade for the multiples of the same pet. Though this usually does not affect rarity or demand, it can, in some circumstances cause demand to rise. This can be seen with a number of pets, like the black advent and the joker dog. Due to their popular designs, people want doubles of them, and so therefore are willing to pay more because there are less in circulation. Some people are against hoarding for this reason, but you must understand that hoarders usually pay well over the value of the pet and put new pets into circulation. For more information on hoarding please check out Seasonal guide here. There are also quite a few very rare items that have rarities just like pets do. The really notable ones are the rainbow smoothie and the chicken o's flag, hat and shirt. These items can be compared to some of the rarest pets in the game, with the rainbow smoothie being possibly the rarest thing on CS. There are only 10 in existence on CS, and the last trade for one involved two sunjewels (which happen to be the rarest dog on the site). So in conclusion, rarities are truly complex and are not easy to grasp. This guide only touches the surface on them. Just keep in mind that not all rares and very rares can be interswapped, and make use of your resources around you. This page was last edited on 7 December 2011, at 07:05.